Opera Philosophica in duas partes divisa, in sections Apparatui Latinae locutionis respondents distincta, & annotationisbus variisque lectionibus ad marginem, opera Alexandri Scot. . . Accesserunt Dionysii Lambini & Fuluii Ursini emendationum rationes. [WITH]: Philosophicorum Librorum pars secunda. Lugduni:: Joan. Pillehotte, 1589., 1589. Two parts in one. 12mo. 779, ; 236,  pp. Waterstains to upper section (visible pp. 1-24). Original full vellum, manuscript spine title. Title applied (ink?) top bottom edge. Very good. 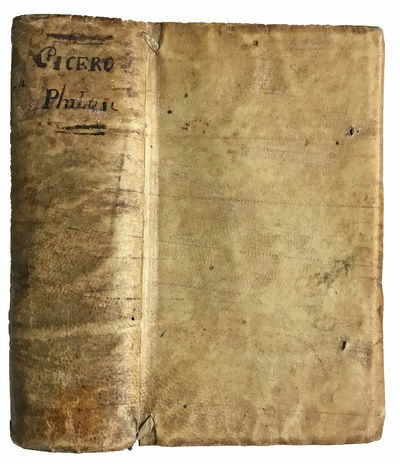 Early pocket edition of Cicero's philosophical works edited by the noted Alexander Scott.